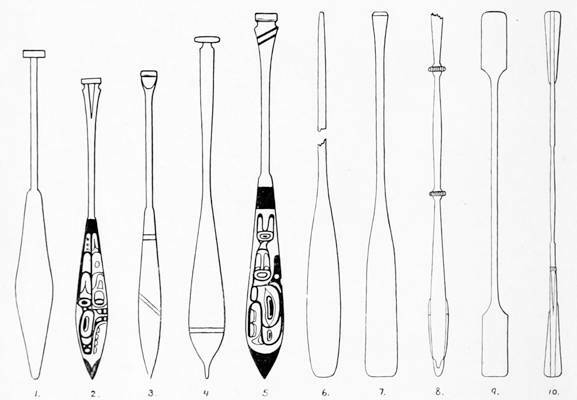 This page contains designs for some of the canoes of the First Nations people of the Northwest Coast. I would be grateful if any reader has other examples they would be willing to share. 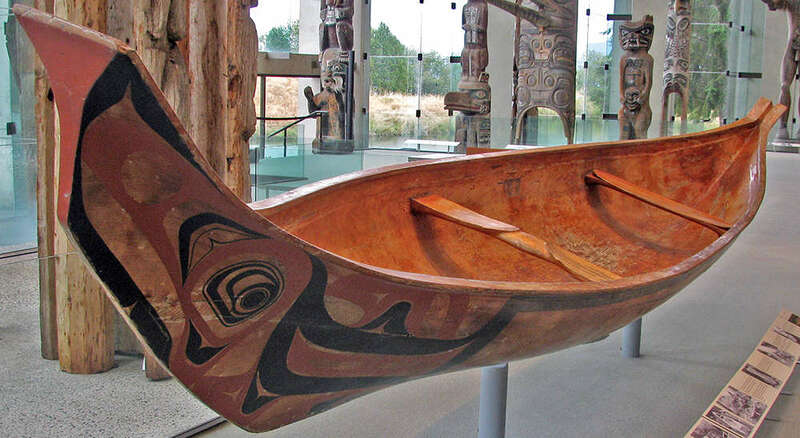 The First Nations people of the Northwest Coast are renowned for their elegantly engineered canoes. 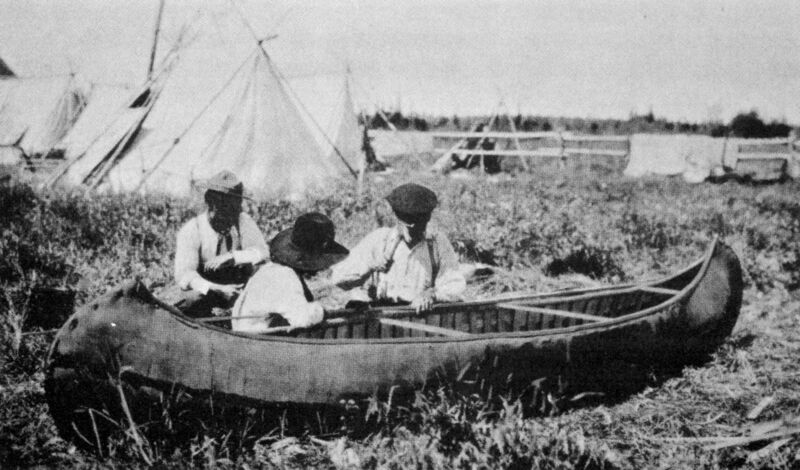 Ranging in length from three to twenty metres, canoes were essential for travel, transport, hunting, and trade. Different coastal communities developed distinctive styles to suit their particular needs. .
Seagoing dugout canoe made in the Haida tradition. Permission: GNU Free Documentation License, Version 1.2, Creative Commons Attribution-Share Alike 3.0 Unported license. 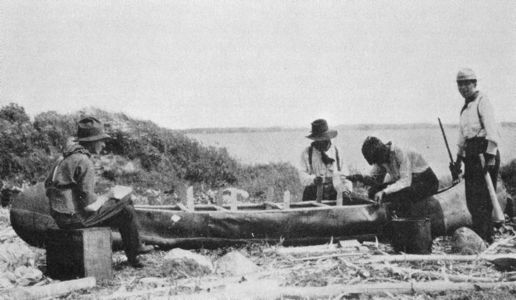 Note that this is a dugout canoe, carved from a log and then covered with canvas, perhaps to add durability. The canvas is secured with a 1/2" round trim below the gunwhale and keel strip or worm shoe on the bottom. 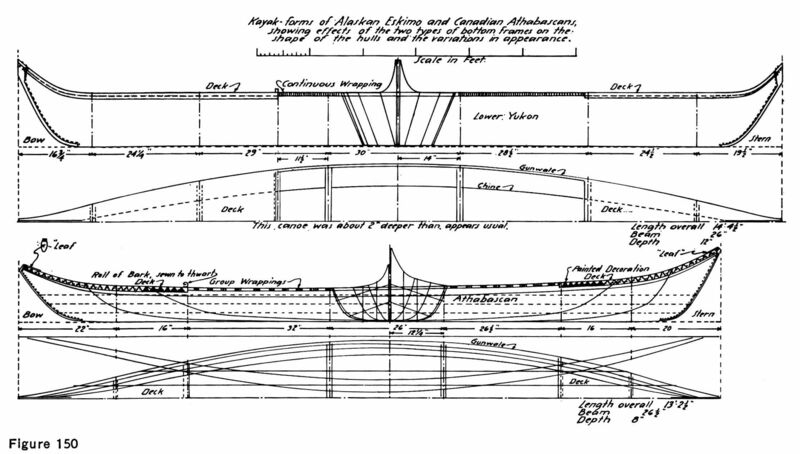 In addition, oak frames have been added to the interior, and spreaders are included forward and aft, presumably for strengthening. The following photos and text are from Adney and Chapelle (1964) unless otherwise referenced. My thanks to David Smith for access to this resource. 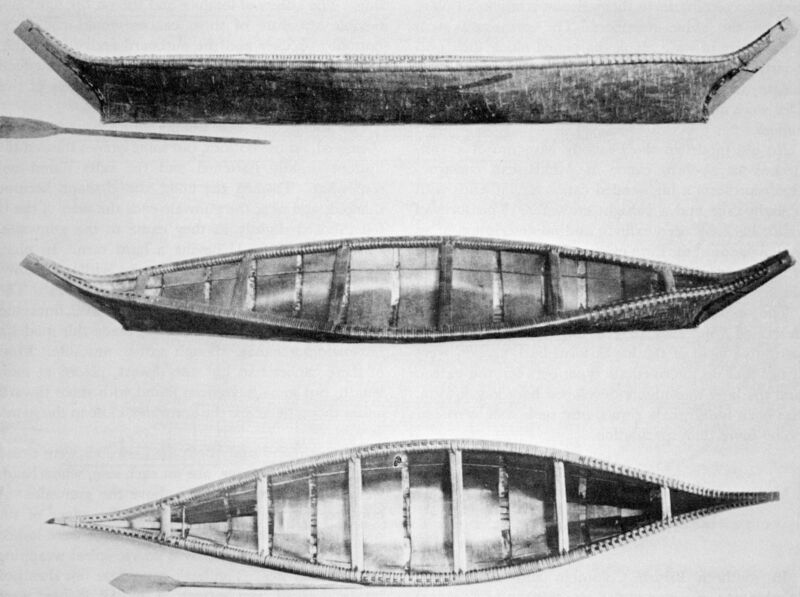 Chipewyan 2-Fathom hunter's canoe (top), with bent stem piece, and Athabascan 2½ fathom canoe (bottom) with plank stem piece. 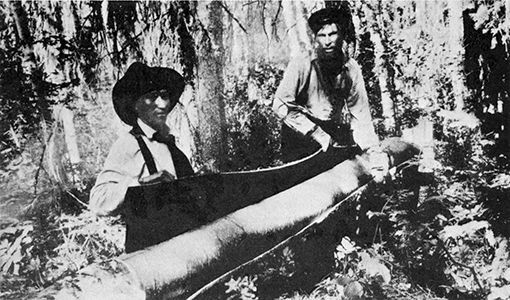 Plank and bent stem pieces were both employed in Athabascan canoes. 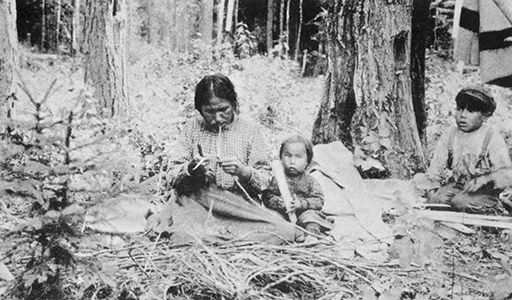 Spruce or birch bark were used without alteration of the design or basic construction methods. 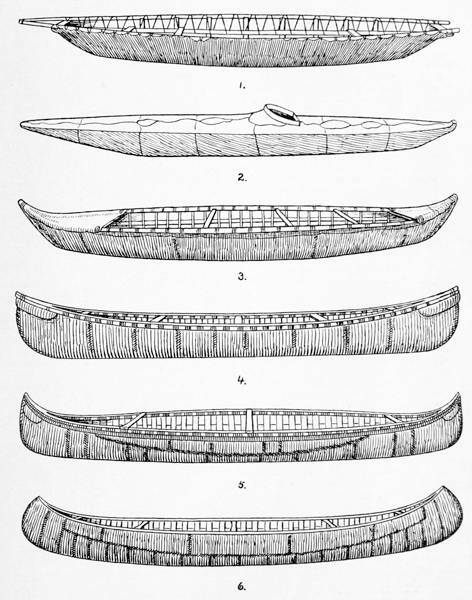 Bark Canoe of the Kutenai and Shuswap, about average in size and proportion, of the Sturgeon Nose type. Original in the Museum of the American Indian, New York. 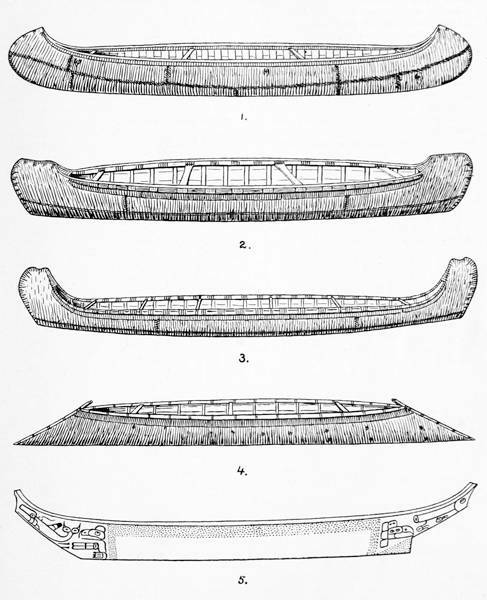 Plank-Stem Canoes of Hybrid Forms, 3-Fathom Slavey (top) and 2½ fathom Algonkin-type Athabascan, probably the results of the influence of fur-trade canoe-building. 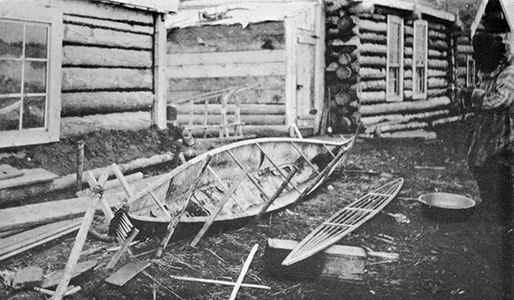 Eskimo kayak-form birch-bark canoe from Alaskan coast, with long foredeck batten-sewn to the gunwales, no afterdeck, and rigid bottom frame. 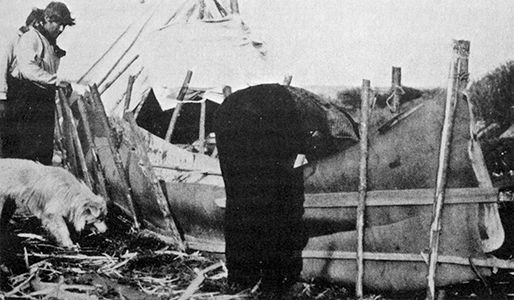 Athabascan hunting canoes of the kayak form, showing characteristic hull shape. These canoes were light, handy, and fast. 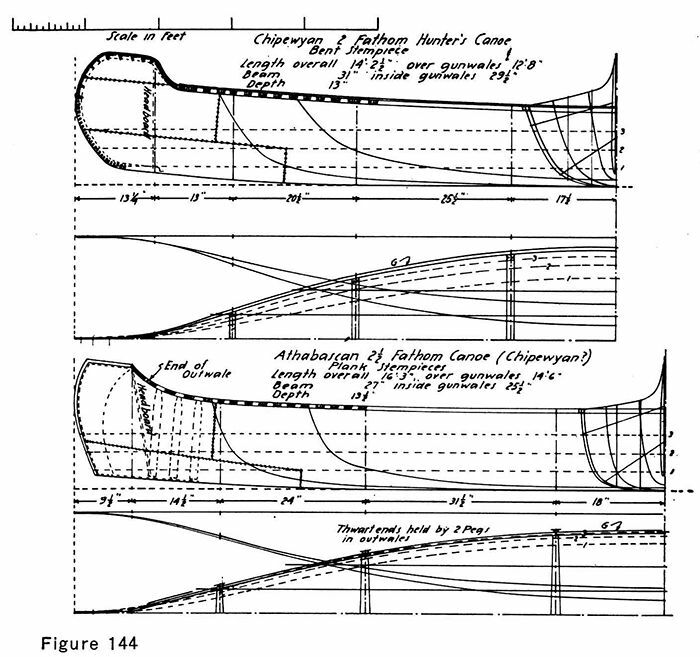 Extinct forms of canoes reconstructed from old models, showing variations in the bottom frame construction and the effects of hull form. 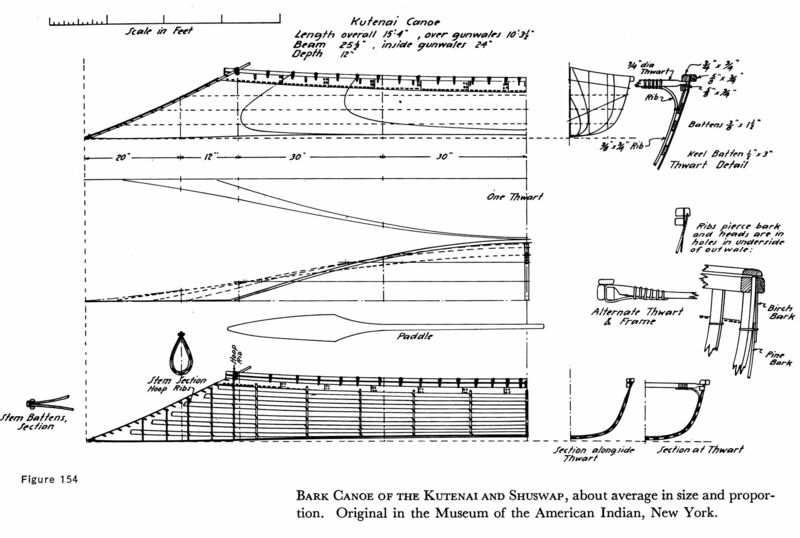 Dimensions are estimated from the sizes of canoes in the area of each example. 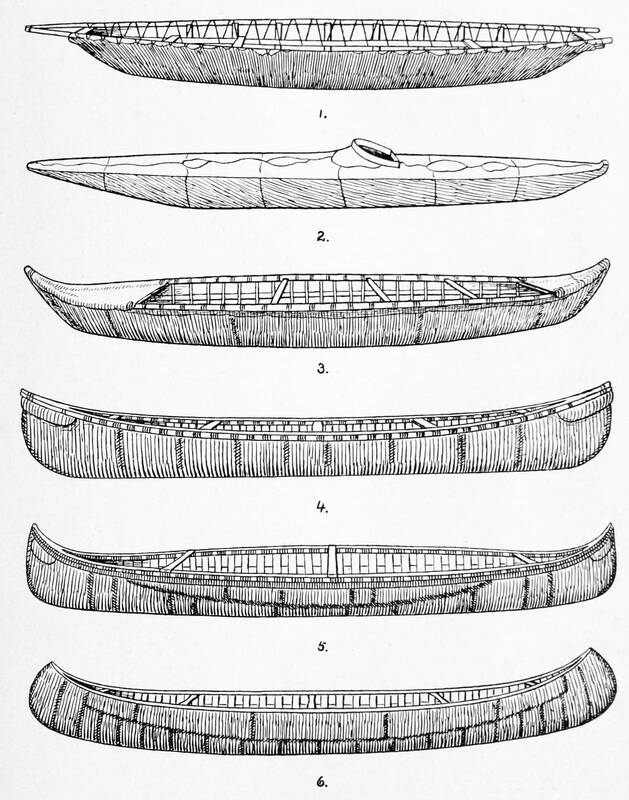 Kayak-form canoes of the Alaskan Eskimos and Canadian Athabascan Indians: chine form of Eskimo birch-bark canoe (above) and the dish-sectioned form of the Canadian Athabascans. Kayak-form canoe of British Columbia and upper Yukon valley. 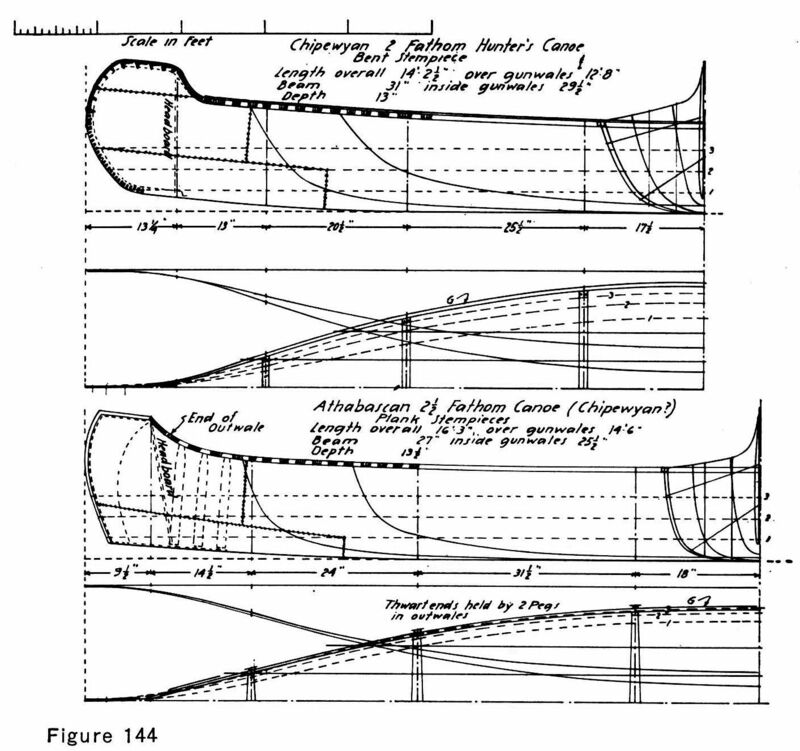 Shows hogged bottom, usual in the type with a rigid bottom frame, which becomes straight or cambered when canoe is afloat and manned. Construction of Kayak-Form Canoe of the lower Yukon, showing rigid bottom frame. (Smithsonian Institution photo). The kayak-form canoes of the lower Yukon and neighbouring streams all appear to have been small canoes tailored to their owner's weight and height: 14 to 15 feet in overall length, 2 to 2¼ feet wide, and 10 to 12 inches deep. 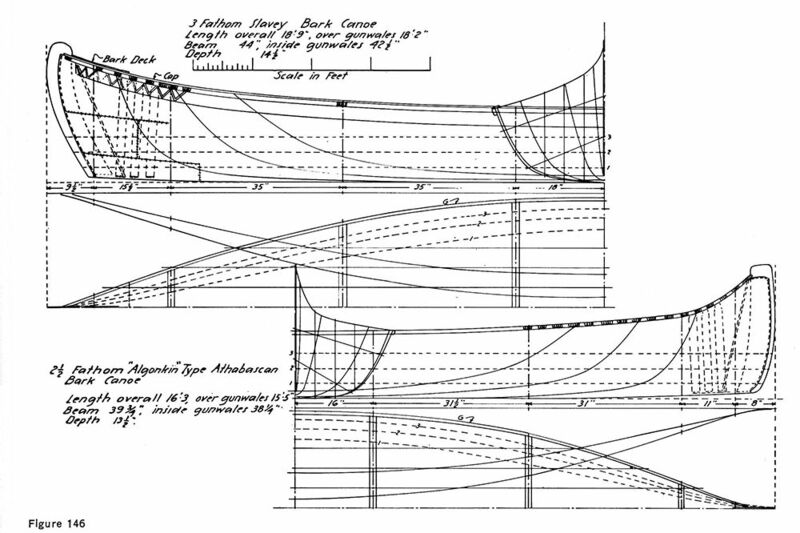 The bottom frame was from 12 to 14 inches wide amidships. 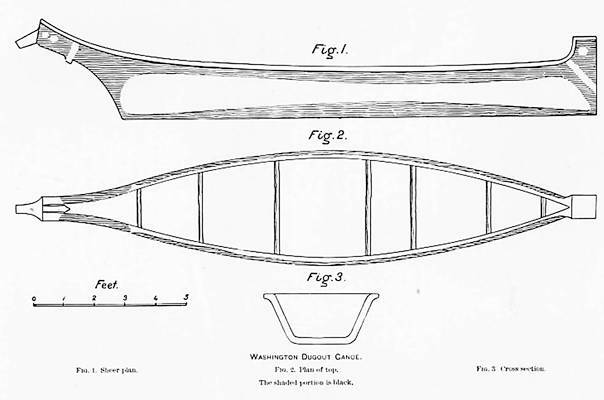 Model of an extinct form of birch-bark canoe, Athabascan type, of British Columbia. In Peabody Museum, Harvard University, Cambridge, Mass. ; entered in the museum catalog as of 1849. 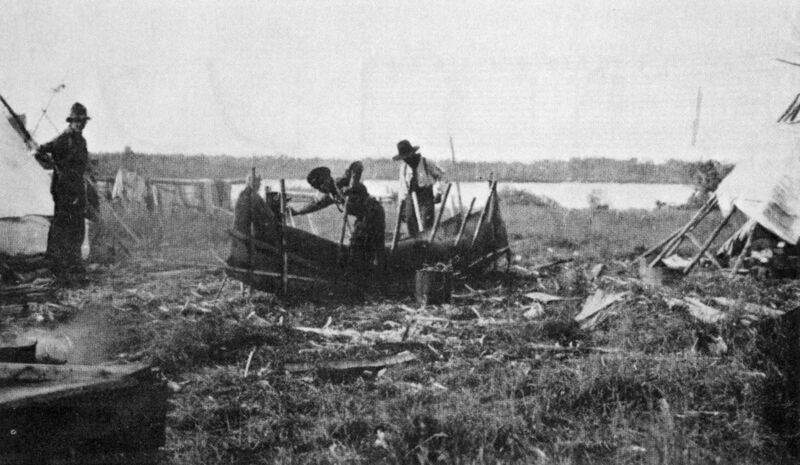 Assembling bark at the building site. 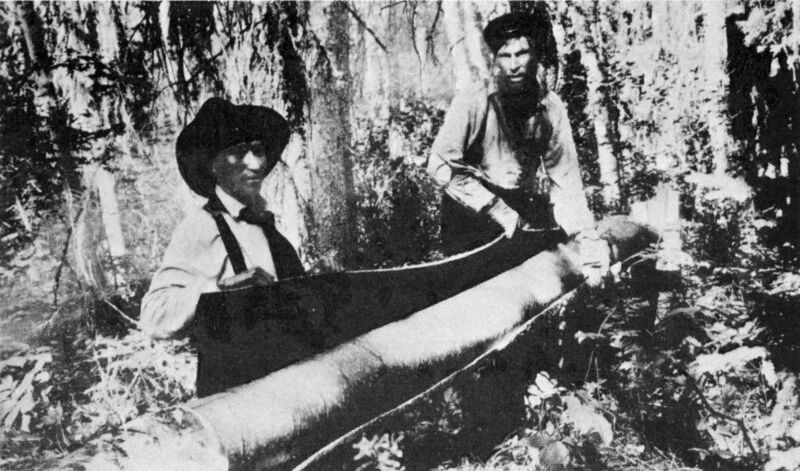 Setting ribs inside bark cover with a mallet. 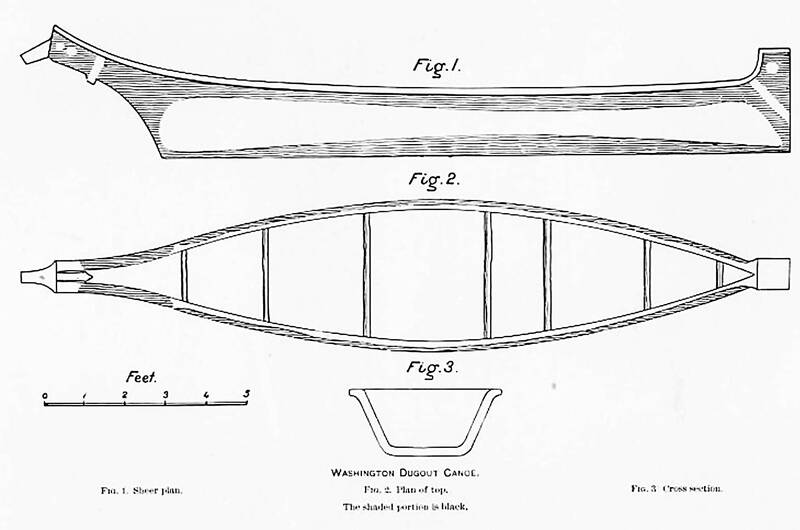 Fitting gunwhale caps on a new canoe. 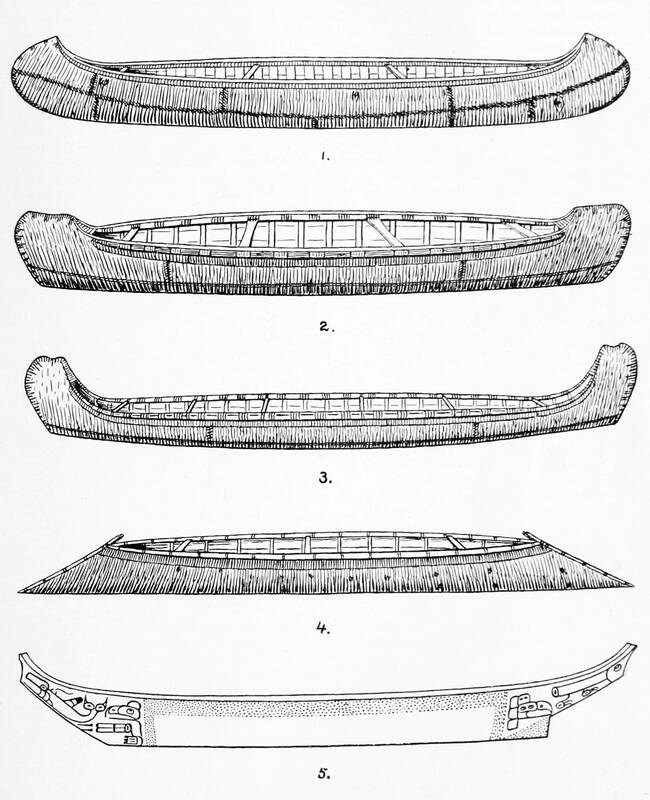 Adney, E., Chapelle, H., 1964: The Bark Canoes and Skin Boats of North America, Smithsonian Institution, Washington D.C. 1964.